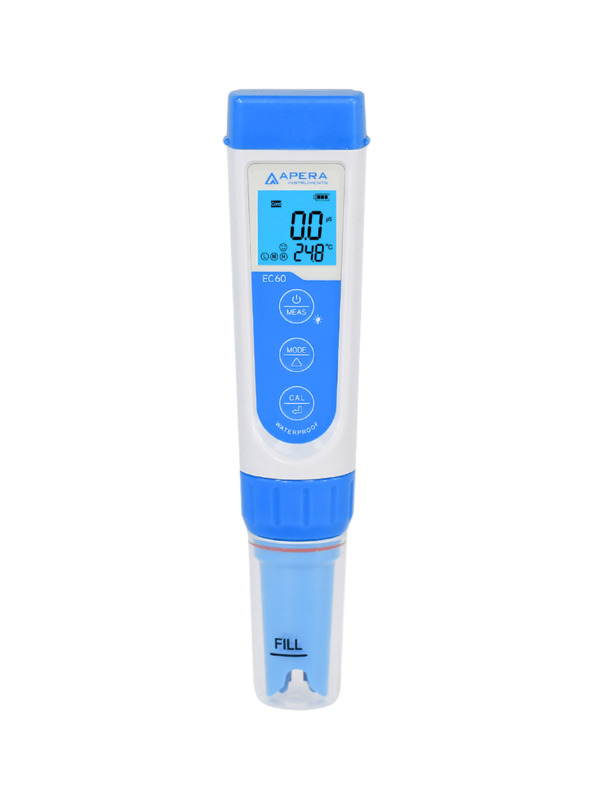 The Apera Instruments EC60 Portable Pocket EC/TDS/Salinity Meter/Tester simply tests all kinds of regular conductivity measurements in an ACCURATE, QUICK, and RELIABLE manner. The applications include hydroponics, tap/drinking water, pools& spas, education, water treatment, environmental monitoring, etc. Up to 3 points of Auto Calibration with auto buffer recognition and 0 to 50°C Auto Temperature Compensation (ATC), 0.01 mS/±1% F.S, 0.5°C accuracy with measuring range of 0-200.0 μS/cm, 0-2000 μS/cm, 0-20.00 mS/cm, 0-50.0°C. APERA's unique BPB (Brush-Resistant Platinum Black) sensor adopts a special processing technology, which minimizes electrode polarization, expands measuring range, and increases the firmness of the electrode, hence ensuring a much higher accuracy and consistency in a wide-range conductivity measurement than traditional stainless steel electrodes, and is easy to clean. 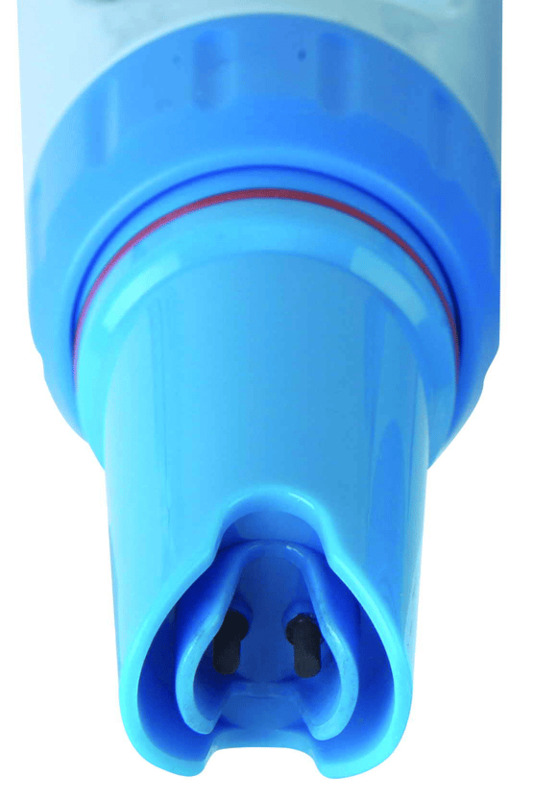 The probe is replaceable and easy to install so that you don't have to buy a whole new meter once the probe is aged. Auto recognition and indication of stable values improves consistency, saving you the trouble of guessing when to manually hold measurement. With a large clear 180° viewing angle screen with 2 backlit colors (blue for measuring mode and green for calibration mode), it supports dual display of temp./EC value and indications of completed calibrations (where M/H indicate 2 points of calibrations) and stable readings (with a smiley face). 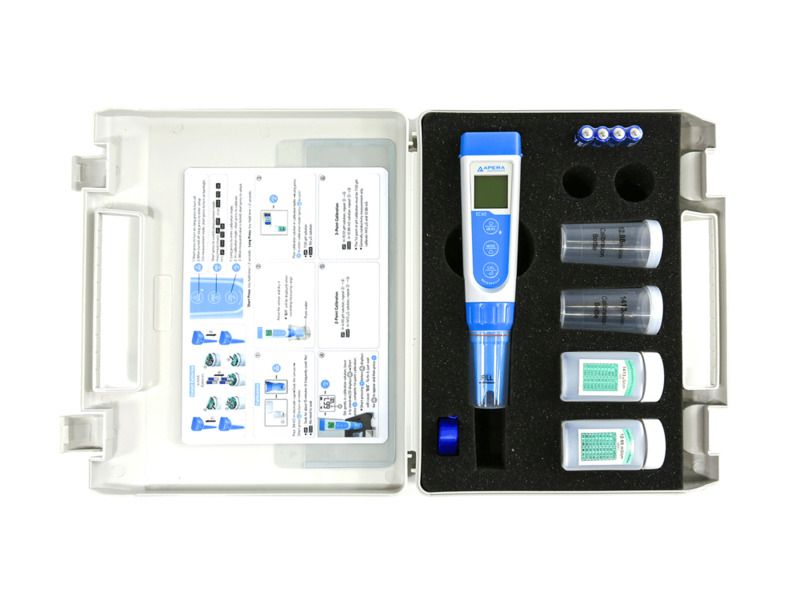 Easy menu setting, customizing your tester functions according to your needs (switch of temperature unit, TDS factor setting, Switch of salinity unit, auto hold on/off). Smart self-diagnosis, warning of out-of-range/preset measurement and incorrect calibrations. Comes with a complete kit. IP67 waterproof and dustproof, floating on water. 1000 hours' continuous operation powered by AAA batteries (with low power warning and auto power off in 8 min if no operation). Warranty: 2 years for the meter, 6 months for the probe. Regular water solution testing, such as pools and spas, hydroponics, tap water, drinking water, water treatment, waste water treatment, aquaculture, etc. Well made, excellent design, accurate, and easy. Really a nice, affordable and reliable brand. We warrant this instrument to be free from defects in material and workmanship and agree to repair or replace free of charge, at the option of APERA INSTRUMENTS, LLC, any malfunctioned or damaged product attributable to the responsibility of APERA INSTRUMENTS, LLC for a period of TWO YEARS for the instrument and SIX MONTHS for the probe from the delivery.